The Hilton Warsaw Hotel & Convention Centre is Polands premier Hilton hotel. This most modern of Warsaw hotels brings a distinctive style of contemporary living to downtown Warsaw. 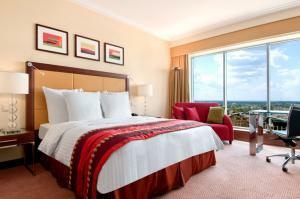 Relax in one of our 314 modern guestrooms and suites, and take in the impressive city views. All our Warsaw hotel rooms feature the latest technology, with high-speed internet access.Savor modern Polish and European cuisine in Meza Restaurant or unwind in the Pistaccio Lobby Bar & Lounge and enjoy a light snack or coffee.Set in Warsaw’s thriving business district, this stylish hotel provides an ideal setting to relax in Warsaw. Retreat to a contemporary guest room or deluxe room. Relax with a movie on the flat screen television or catch up on work with high-speed internet access. The in-room internet connection rate is 38 PLN for 24 hours. Free internet access is available in all public areas of the hotel, and friendly staff at the Front Desk are happy to offer assistance. Indulge in a corner suite or executive room with panoramic city views and Executive Lounge access. The Executive Lounge on the top floor offers complimentary breakfast and refreshments.Unwind after a busy day at the contemporary Pistaccio Lobby Bar & Lounge boasting floor-to-ceiling city views. Indulge in coffee, cognac or a malt whisky in the relaxed ambience before sampling Polish and international cuisine at Meza Restaurant.Host a conference, business meeting, function or wedding in contemporary surroundings with easy access to Warsaw city center and airport. The hotel features 3,000 square meters of event space at the Convention Centre. Select from a wide range of flexible meeting rooms. Plan an event for 1,600 guests at the elegant Warsaw Hall. The hotel boasts a fully equipped business center with contemporary design throughout.The hotel boasts 3,800 square meters of health and fitness facilities at the Holmes Place Premium Club. Swim lengths of the 25-meter swimming pool, work out at the fitness center and indulge in spa treatments. www.conferencehotels.eu offers you a free and comfortable search for conference hotels in Warsaw. Here you will find the most popular conference hotels which Warsaw has to offer and which you can request directly online with the best conditions available.